Solar Impulse 2, a solar-powered airplane, finished its historic trip around the world, which started back in March 2015. The plane landed in Abu Dhabi early Tuesday. 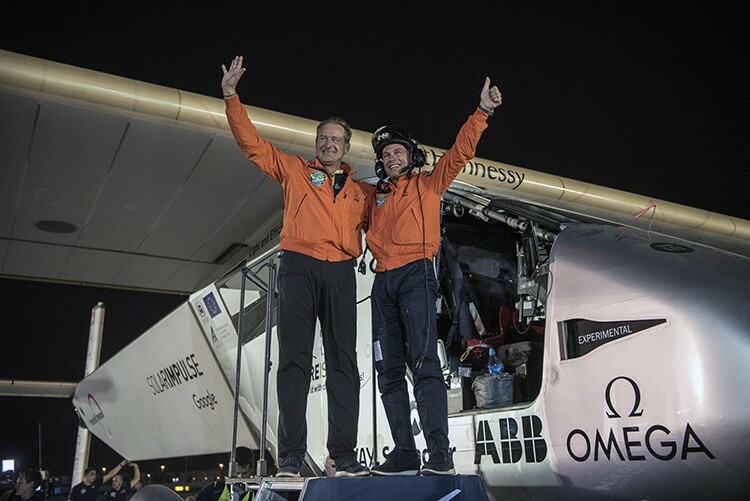 André Borschberg (left) and Bertrand Piccard (right) celebrate after Solar Impulse 2 landed in Abu Dhabi, completing an historic trip around the world. Solar Impulse traveled around the world, breaking the journey down into 17 legs, spending a total of 23 days in the air. The plane, powered by 17,000 solar cells, traveled 42,000 kilometers (about 26,100 miles) in a little more than a year. Its trip across the Atlantic Ocean from New York City to Seville, Spain, alone took approximately 90 hours to complete, traveling at 140 km/h (about 87 mph). The plane’s longest trip was from Japan to Hawaii, which lasted almost five days. Bertrand Piccard and André Borschberg alternated piloting the solar-powered plane. On the ground, they were helped by a team of 30 engineers, 25 technicians and 22 navigation controllers.